The following families have genealogy eBooks on this page: Coffin, Comins, Crehore, Dewey, Dresser, Eldred Eldredge, Hitchcock, Keese, McKinstry, Mesier, Patten, Peirce, Rainborowe, Russell, Thompson-Given, and Waite. Welcome to Bookshelf 12 at Hawkeyes Trading Post! 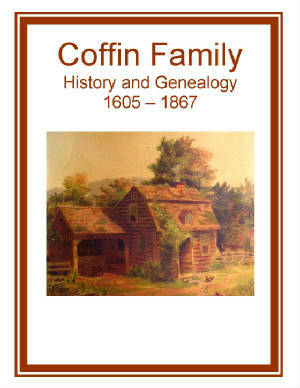 Coffin Family History and Genealogy. PDF eBook English 1.01 MB 1868. This publication has 6 generations of Coffin descendents from the year 1605 to 1867. It confirms immigration to the American Colonies in 1642. The information is from The Family Record Volume 1 Number 1 which was published about 1868. The family information begins on page 7 of this 19 page rare publication. This essential genealogical information provided for the Coffin family may be unique to this publication! That's why it's here. Price $6.95 USD. 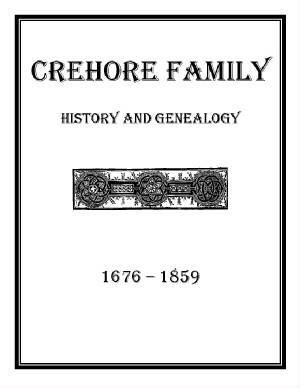 Crehore Family History and Genealogy. PDF eBook English 575 KB 1887. Essential information on family descendants ranges from the years 1676 to 1859. The Last Will and Testament of Timothy Crehore in 1739, family Deeds from Suffolk in 1717, an early map of the area, Milton and Dorchester Town Records, and Church Records for the 1700s listing Crehore family members. All this is included in a compact 11 page eBook. A source of important documentation for the family genealogist! Price $6.95 USD. Dresser Family History and Genealogy. PDF eBook English 1.11 MB 1913. 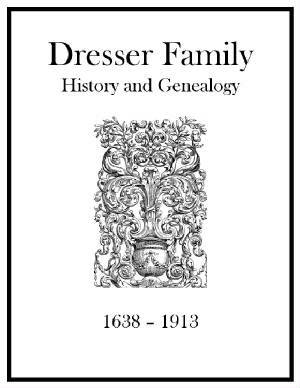 In this eBook 9 generations of Dresser family descendants are detailed, that lived between the years 1638 up to 1913! In the mid 1600s the family purchased land from the Ezekiel Rogers Plantation, that later became the town of Rowley Massachusetts. An excellent account of Colonial America history and the Dresser family genealogy in those rural days! Price $6.95 USD. McKinstry Family History and Genealogy. PDF eBook English 1.63 MB 1858. An extraordinary history of the family originating in Edinburgh Scotland then immigrating to Northern Ireland in 1669. Immigration spread across the Atlantic to the American Colonies with family members moving on to California likely for the gold rush in 1849! Essential dates cover descendants from the year 1669 up to 1857! The book was written prior to the War Between the States! 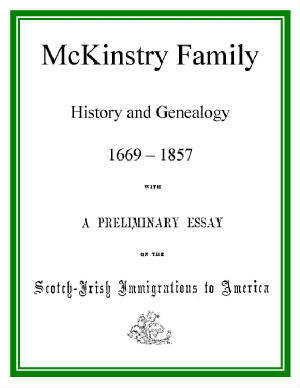 A wonderful reference for any family member interested in McKinstry genealogy! Price $6.95 USD. 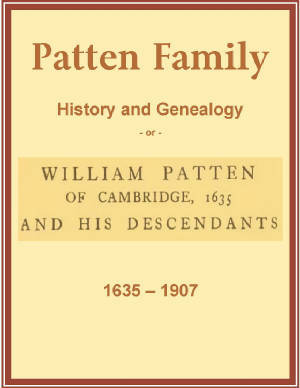 Patten Family History and Genealogy. PDF eBook English 13.7 MB 1908. This eBook provides the family legend that the surname originated either in Scotland or Northern Ireland in the 15th century. Essential dates begin with William Patten of Cambridge, Massachusetts, in 1635 and stretch with descendants up to the year 1907! There is an index of 27 pages listing over 2,500 descendants and in-laws! Also, a map of Cambridge in the year 1635 is included! A magnificent reference for the family genealogist! Price $6.95 USD. 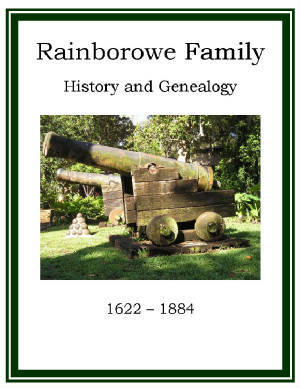 Rainborowe Family History and Genealogy. PDF eBook English 1.65 MB 1886. This eBook is packed with information including several Last Will and Testaments, tales of Atlantic Pirates in 1636, and essential family statistics extending from the year 1622 up to the year 1884. Tales of the tale wooden ship, and merchant vessel, named RAINBOWE OF LOUDON, with yarns and lore! A wonderful genealogical reference for any family member! Price $6.95 USD. 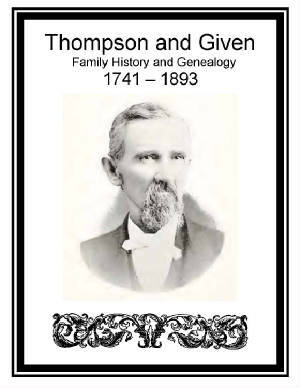 Thompson and Given Families History and Genealogy. PDF eBook English 9.79 MB 1898. The families Scottish origins are briefly mentioned in this publication, while essential dates and short biographies are provided for descendants who lived during the period 1741 to the year 1893. A 15 page index is included which lists over 400 family members! An excellent resource for the family genealogist! Price $6.95 USD. 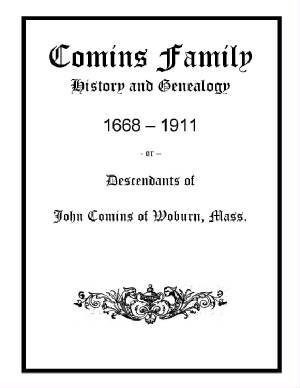 Comins Family History and Genealogy or Descendants of John Comins of Woburn Mass. PDF eBook English 1.77 MB 1915. 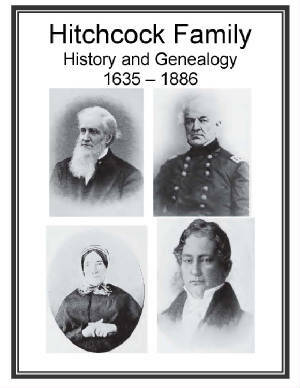 Essential information for Comins family members extends from the year 1668 to 1911 in this excellent resource of family history! There are 9 generations listed of kindred that extend back to the early days of the American Colonies! A great source of genealogy! Price $6.95 USD. Dewey Family History and Genealogy or Descendants of the immigrant Thomas Dewey. PDF eBook English 2.0 MB 1913. 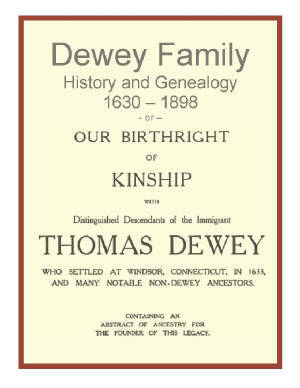 This eBook focuses on the kinship with descendants from the immigrant Thomas Dewey who originally settled at Windsor, Connecticut in 1633. Essential information on the family descendants extends from the year 1630 to 1898. There are numerous biographies of many Dewey family ancestors, which highlight their accomplishments during that period! This is a treasure chest filled with genealogical information! Price $6.95 USD. 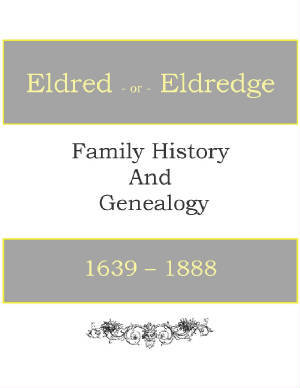 Eldred or Eldredge Family History and Genealogy. PDF eBook English 1.04 MB 1911. This publication indicates that it was Robert Eldred who was first mentioned in colonial American records on May 25th of 1639. The family name was frequently misinterpreted due to various accents and became Eldredge for many of the kindred. There are 5 generations of descendants listed in this eBook that span the years from 1639 to 1888 with 6 pages of references! The text is faded with time, yet still very legible to obtain essential genealogical information! Price $6.95 USD. 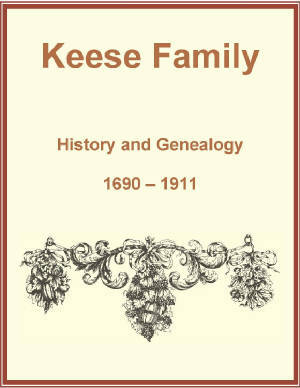 Keese Family History and Genealogy. PDF eBook English 4.21 MB 1911. This eBook presents the Keese family history as they migrated from Germany to Holland to avoid religious persecution, and the eventual immigration to the American Colonies. Inspirational poetry authored long ago, short biographies of many family members, along with the Keese families early history in the Quaker religion is highlighted. The poor qualities of the photographs are due to the ongoing deterioration of the original hard bound edition published 100 years ago. A solid resource for documenting genealogy! Price $6.95 USD. 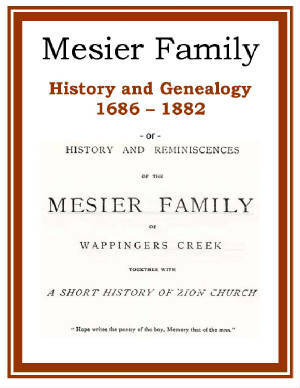 Mesier Family History and Genealogy or History and Reminiscences of the Mesier Family of Wappingers Creek. PDF eBook English 1.69 MB 1882. This eBook is a delightfully written publication with poetry, short biographies on many family members, and 5 generations of descendants beginning with Peter J. Mesier in 1724. The family history dates back to 1686 with information dating up to the year 1882. There is a short history of the Dutch Church or Zion Church of which some ancestors were members! A great link to the past for the family genealogist! Price $6.95 USD. 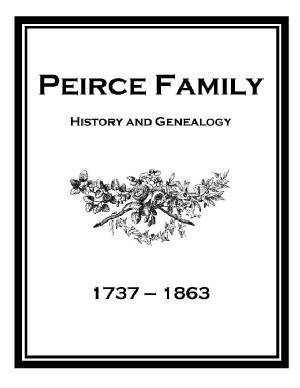 Peirce Family History and Genealogy. PDF eBook English 1.19 MB 1867. Captain Joe Peirce was the 3rd son of Ebenezer and Mary (nee Haskins) Peirce born November 29, 1737. He apprenticed to a blacksmith until hostilities between England and France began. This publication is a very notable account of Peirce family history during the French and Indian Wars, and the early history of the American Colonies! Essential information on family ancestors stretches from 1737 up to 1863. A 20 page well articulated and intriguing genealogical reference for all family members! Price $6.95 USD. 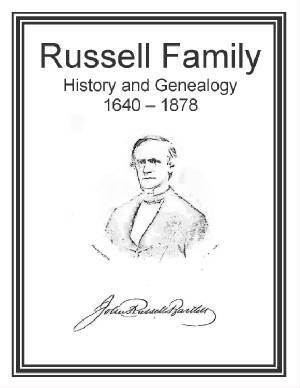 Russell Family History and Genealogy or Descendants of John Russell of Woburn Massachusetts. PDF eBook English 15.6 MB 1879. An intriguing, and certainly fascinating family legend of the House of Russell with ancient lore referring to Hugh de Rozel in Normandy. The legend goes back to the first crusade! The eBook includes centuries old family letters, and an 18 page index with over 1,500 descendants from the period 1640 up to 1878! There are 7 generations of kindred documented! A wealth of information for the family genealogist! Price $6.95 USD. 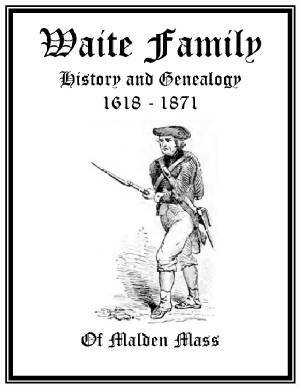 Waite Family History and Genealogy or The Waite Family of Malden. PDF eBook English 1.00 MB Year 1878. Waite family members were residents of Charlestown when it was burned by the British during the American Colonial War. This eBook is packed with essential information on 7 generations of descendants that range from the year 1618 to 1871. Condensed print provides thirteen pages of extraordinary genealogy for any Waite family member! This great reference may feature rare genealogical information not found elsewhere! Price $6.95 USD. We use PayLoadz for safe online transactions. Payloadz supports PayPal, Google Checkout, 2Checkout, Amazon Payments and more.